Microsoft recently launched Cortana for Windows mobile 8.1. Siri and Google Now are pretty good vitual personal assistant apps for iOS and Android respectively. 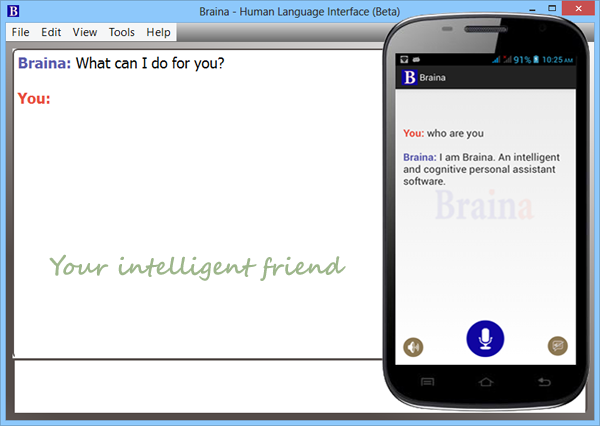 Here comes Braina, a very intelligent and useful digital personal assistant software for Windows OS from Brainasoft like Jarvis from Ironman. Braina is the worlds best artificial intelligent software for Windows computer and it is totally Free. It works on Windows XP, Windows Vista, Windows 7 , Windows 8 and Windows 8.1. Braina is a powerful software that remembers, infers, analyses, thinks and learns from experience to provide effective feedback. Braina can understand English language very well and thus you can ask it to perform various tasks in your natural language. Braina also comes for Android but Android app cannot work independently and needs Braina installed on your computer. Braina for Android app can be used as an external wireless microphone to work with Braina installed on PC. This means you can speak in your phone to play song from anywhere in your house and the song will be played on your computer! You can ask Braina to play songs providing song name, artist(singer) name or album name. If you liked the post, Share on Facebook, Tweet and Google Plus (use buttons above). You can also Subscribe to our feed via Email for free. © Copyright 2019 Brainasoft. All Rights Reserved. The content is copyrighted and should not be reproduced. Powered by Blogger.